Hidradenitis Suppurativa is a long term and rare skin condition that features small and painful lumps under the skin. This condition usually affects the areas where the skin rubs together such as in the armpits, groin, between the buttocks or under the breasts. It is painful and the lesions may drain and smell foul. Patients may feel bad about themselves owing to the symptoms. It occurs around hair follicles with many oil and sweat glands. It can affect one spot or multiple areas of the body. It is not an infectious disease. The lumps develop in the skin may break open and smell or can cause tunnels under the skin. This skin disorder usually starts after the puberty and it can persist for many years and gets worsen over time. It can persist for many years and gets worsen over time. Early diagnosis and treatment of Hidradenitis Suppurtiva can help to manage the symptoms by preventing complications such as scarring. According to modern medicine, the cause of Hidradenitis Suppurativa is not known. It mostly affects areas bearing apocrine sweat gland or sebaceous gland such as the underarms, inner thighs, groin area, under the breasts etc. Some aggravating factors should be taken into consideration such as: obesity, tight clothing, deodorants, humid climate, use of oral contraceptive pills etc. Blackheads: The small pitted areas of skin contains blackheads which often appears in pairs or in a "double-barreled" pattern. Bumps: The red and tender bumps often enlarge and break and drain pus. This drainage may have an odor accompanied by itching and burning. Painful and peas sized lumps: Hard lumps develop under the skin which become enlarge and become inflamed. These lumps may persist even for years. Tunnels: Tracts which connect lumps may form under the skin. They can even form pus. WHAT IS THE TREATMENT OF HIDRADENITIS SUPPURATIVA? Chronic diseases such as Hindradenitis Suppurativa do not have definitive treatment in modern medicine. Antibiotics, anti-inflammatory agents including steroids are prescribed. Corticosteroids such as: injecting steroid medications directly into the tender nodule can help to get rid inflammation. Tumor Necrosis Factor (TNF)-alpha inhibitors are also prescribed but these medicines cause serious side effects. 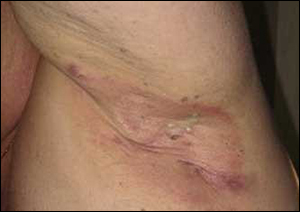 Hidradenitis suppurativa often goes undiagnosed for years because patients are too ashamed to consult physician earlier so that persistent lesions may lead to scarring and the formation of sinus tracts or communicating abscesses or infection under the skin. At this stage, complete cure of the disease is not possible and requires surgical excision followed by skin graft but this treatment is very expensive and therefore affects physical and psychological status of the patient. The surgical treatment for hidradenitis suppurativa may lead to serious and fatal complications because of rich artery, vessels and lymphatic drains which is commonly known as vital area and such areas are known as 'Marma' in Ayurvedic terminology. 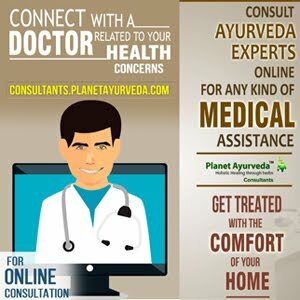 Therefore, there is a need of alternative and safe treatment to help patients suffering from Hindradenitis Suppurativa. According to Ayurveda, it occurs due to the vitiation of Pitta and Vata and due to Rakta dusthi. Kanchnaar Guggul by Planet Ayurveda is prepared from the bark of the tree Bauhinia variegata. It is useful in the treatment of diseases which are caused by blockages in the body such as: cysts, benign and malignant cancers, hodgkin's lymphoma, chronic gangrene, fistula in ano. These tablets give excellent results in Hindradenitis Suppurativa because the main cause of this disease is blockage. DOSAGE: 2 tablets twice daily. 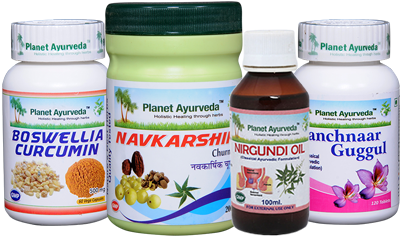 Navkarshik Churna is an Ayurvedic formulation dating back to 1100 A.D. The various herbs present in this churna act in a synergistic manner. It contains Triphala as a main ingredient which helps in removing toxins from the body and contains various herbs such as: neem, katuki, manjistha which act as blood purifiers. Giloy is an excellent immunomodulatry herb and Daruhaldi is considered as an anti-inflammatory herb. Boswellia Curcumin Capsules offered by Planet Ayurveda are one of the most effective combination of anti-inflammatory herbs. Curcumin is a very famous anti-inflammatory herb having potent effects similar to the efficacy of corticosteroids. Boswellia is another anti-inflammatory herb which is widely used in the treatment of blockages. Thus, Boswellia Curcumin Capsules by Planet Ayurveda is very useful for the patients suffering from Hindradenitis Suppurativa. DOSAGE: 1 capsule twice daily after meals with plain water. Nirgundi Oil of Planet Ayurveda is prepared from the herb Vitex negundo. It is processed with extracts of some other herbs such as: Haridra, Manjistha and Kalihari. This oil is mainly used in wound healing. It is categorized as anthelmintic and anti-toxin. This oil is the richest source of Vitamin C which makes it one of the best anti-inflammatory and anti-biotic herb. It is considered as analgesic so it relieves pain. USAGE: Nirgundi oil is used for external application only. Apply on the affected skin area with cotton swab, 2 times daily.